Assyrians around the world marked the festival of Akitu this week, a spring holiday that commemorates the beginning of the Assyrian New Year 6767. 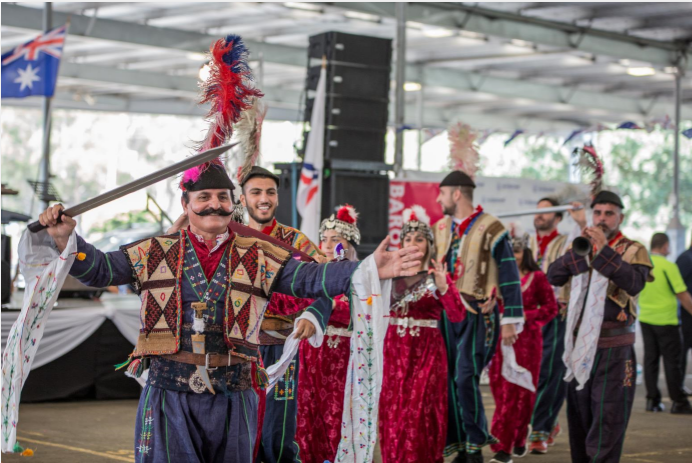 The world’s approximately 1.5 million Assyrians celebrate on the first day of April (Nissan), marking the arrival of springtime just a week after their Kurdish neighbors celebrate Nowruz and a day before Iranians celebrate the picnic holiday of Sizdah Bedar. Akitu is also called Kha b’Nissan (ܚܕ ܒܢܝܣܢ), which means “the first of April,” or Resha d’Sheta (ܪܫܐ ܕܫܢܬܐ) meaning “Head of the Year,” in the Assyrian language, also called Neo-Aramaic. Assyrian New Year is celebrated with marches, parades and parties everywhere Assyrians live, from Nohadra (Dohuk), Ankawa, Kirkuk, and Baghdad in Iraq, Khabour, Qamishli, and Damascus in Syria, Urmia and Tehran in Iran, Mardin and Istanbul in Turkey, as well as in cities like Stockholm, Sydney, Chicago, Phoenix, Tucson, Yerevan, Munich, Turlock, Moscow, Detroit, and many other places in the Diaspora. The holiday is celebrated by all Assyrians, including those of Syriac, Chaldean, and Aramean backgrounds. Assyrian New Year shares roots with Nowruz and other springtime holidays, like Sham al Nassim in Egypt. Assyrian New Year is linked to the beginning of Spring, like Nowruz, but because of changes in the Christian calendar the dates have drifted apart. Beginning in the mid-20th century, Assyrian intellectuals in Iraq began exploring the holiday’s connection to ancient Assyria. As Sargon Donabed notes in his history of modern Assyrians in Iraq, in the 1950s and 60s Assyrian intellectuals developed a variety of literary and cultural magazines and journals with government support, contributing to an intellectual renaissance. This was also the period when the Assyrian flag was designed by Iranian Assyrian George Bit Atanus in 1968. During this era, the connections between the contemporary festival and the ancient festival of Akitu were noticed – including the fact that Akitu historically had 12 days, similar to Iranian celebrations of Nowruz (which end on the 13th day). The beginning of the Assyrian calendar was fixed at 4750 BC. Akitu was traditionally a celebration of the sowing of barley in ancient times, and given that the ancient Sumerians discovered both bread and beer it seems only fitting that it was one of their major holidays. Today both Akitu and Assyrian New Year are used interchangeably, with Ras al-Sanna al-Ashuriya (رأس السنة الآشورية) being the most common term in Arabic. In the Assyrian language, well-wishers greet each other with Reesh Shato Brikhto, Reesha D’Sheeta Brikhta or Akitu Breekha. Although in the 1960s an Assyrian intellectual renaissance occurred, when the Baathist regime took power such cultural freedoms were squashed. Under Saddam Hussein’s rule, Assyrians celebrated at home, but beginning in 1991 in northern Iraq the holiday became a major moment for Assyrians to assert their identity publicly in ways that had been historically forbidden. 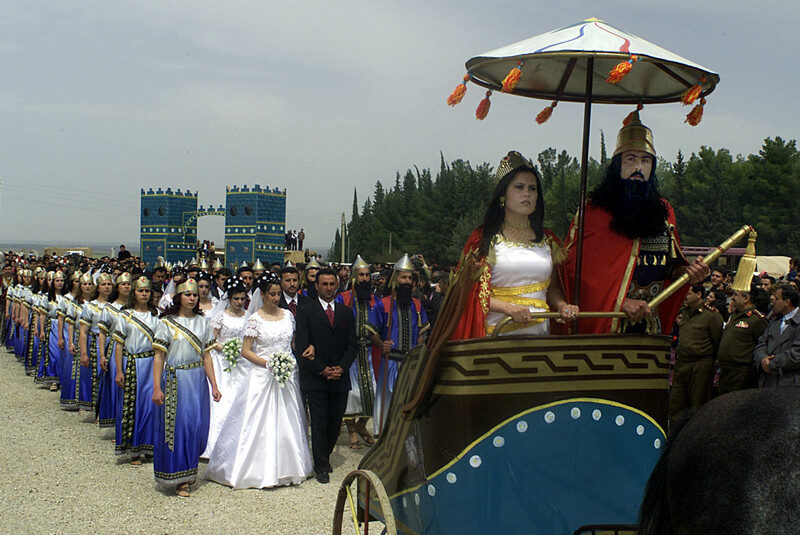 “Since the early 1990s, we’ve celebrated with huge parades and marches in many cities across northern Iraq where we celebrated with music, banners, and demanding our rights as people,” Samuel told Ajam, noting that celebrants generally wear traditional Assyrian outfits along with spring colors, traditional clothes, and red poppy flowers. Today, Akitu’s most well-known tradition is Deqna Nissan (ܕܩܢܐ ܕܢܝܣܢ), which literally means the Beard of April. For Deqna d’Nissan, Assyrian women traditionally gather flowers, grass, and decorations into a garland that is hung on the door of the family home. These days, even though celebrations are subdued, the marches continue as do family picnics and parties, many of which take on a nationalistic tone as a result. But in its modern incarnation, Akitu has always been both the start of the Assyrian New Year as well as April Fools – meaning that while celebrating is a serious matter, there’s always a lot of joking around involved as well.